4 Subscribers onlyTropical fruits cooling off? 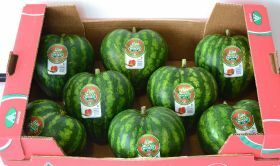 Europe’s leading watermelon supplier, Anecoop, has expanded its Bouquet seedless watermelon offering with the launch of the first Spanish-grown heart-shaped mini watermelon. The amorous fruit was produced by one of Anecoop’s partner cooperatives at the request of a British supermarket to satisfy the demands of its premium customers seeking novelty and differentiation. The first consignment of the watermelons, which are of the same variety as the company’s Bouquet mini watermelon, was shipped to the UK this week. It will be available throughout the summer. The fruit’s distinctive shape is achieved using a completely natural technique in the field. Anecoop said it plans to grow the fruit exclusively on request. Sold in 30 countries, Bouquet watermelons are one of Anecoop’s flagship products. This year the company plans to market 150,000 tonnes of watermelons, of which 80 per cent will be seedless Bouquet watermelons.